Ras Al Khaimah, UAE: From 21- 24 May, Rixos Bab Al Bahr will play host to the most prestigious Event Management Federation, that will see performances by industry powerhouses- Lucky Ali, Ankit Tiwari, Ash King, and DJ Shadow. The global convention and awards that will be attended by more than 300 event managers and wedding planners from 8 countries, has been touted to be the largest event of its nature in the region. The event will also feature speakers by the likes of international cricketer DJ Bravo, celebrated Bollywood actor Shatrughan Sinha, award winning producer Sam Katiela and events connoisseur Maya Toubia. Bollywood beauty Bipasha Basu and award winning music composer Arko are also set to bring the glamour quotient to the night, with their presence. The gala is set to raise the curtains on events and entertainment, with facets of the sector being explored during the course of the night. With the best of music, comedy, and industry insight, this year’s Event Management Federation will truly be one for the books. 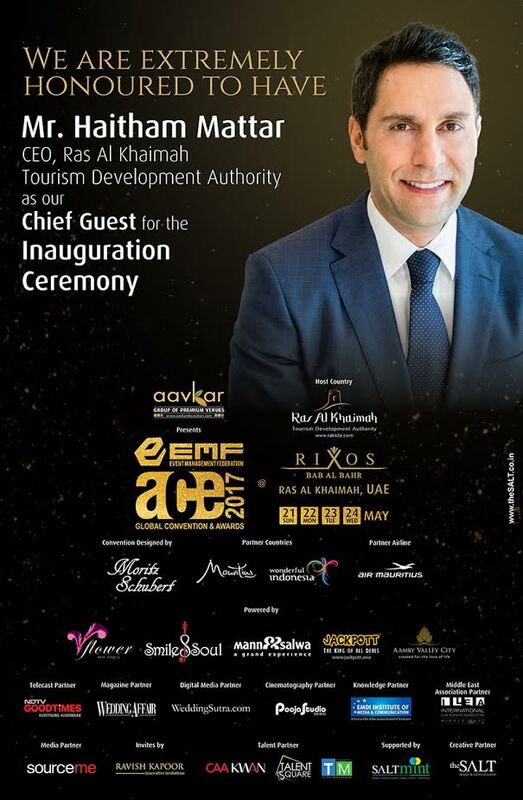 Haitham Mattar, CEO of Ras Al Khaimah Tourism Development Authority will be the Chief Guest for the night and do the honors during the inauguration ceremony. “The one of a kind event will bring together leading persons of the events and entertainment industry from all over the world. Guests can expect a glimpse into the fabulous world of celebrity at Rixos Bab Al Bahr,” said Ali Ozbay, Director of Marketing & Communications of Rixos Hotels.